And welcome to the newest line of 2015 calendar months called March! When you step into the car, make sure your back is against the cushion and the bar is closed and locked firmly into place. Whooshing will commence immediately. And I mean immediately with me whooshing in and out of this post, highly unusual for me, but needs must today. Over at Less Is More this week, the team wants to know what makes us happy. That's presents a broad expanse of creative possiblez. Aside from family and friends and good health and good weather and a lot of money, two things immediately came to mind in equal proportions. First, of course, is chocolate. Enough said! So, okay, I'm on restriction at the mo, but it still makes me happy! I was going to choose wodka, but that would be unseemly. Next, or rather, equal to, of course, is making cards. Two more for my Twofer Campaign. 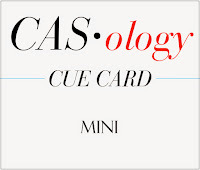 CASology: Mini, as in my mini square of dark chocolate. The links will provide you with lots of inspiration and the details on rules, sponsors, and prizes! Jajajajajajajajajajaja mine too!!!! This card is completely awesome outside and inside!!!! It is muy favourite from this challenges! Good luck!!! Loving both of your awesome TWOFER's!!! How are you getting on with those brusho's? I was at a brusho workshop yesterday and it reminded me to ask you. Must admit chocolate is almost top of my great love list. Both of your cards are really super as always Darnell. Happy March to you. Great cards Darnell and Happy start of March to you - spring must be on its way now. Love these Cas designs. I'm so with you on the chocolate addiction ... ehm ... love of chocolate and I can relate to the joy of card making as well. Your second card made me laugh out loud. When my DH wanted to know the cause of my laughter, I showed him both cards after which he started laughing too. Gotta love a man who shares his wife's sense of humour (and indulges her love of card making and resulting shopping sprees). Have a wonderful Sunday! Life certainly IS too short. March already? Easter eggs in the shops. Hot cross buns in the bakery. YEEEEEK!!! Anyways..... adoring your less is more. Although I must dispute this assertion as far as chocolate goes!!! Love the card [s] though:):) Fabulous! Fabulous cards Darnell such great images and your CAS designs are perfection. Well I find myself in TOTAL agreement with all the thing that make you happy Darnell . . . they also make me happy! Chocolate may not be good for the hips . . . but it sure is good for the SOUL! My first blog was called "Chocolate is not JUST for Breakfast"!!!!!! Love your cards, Darnell - they are both things that make me happy too! I ate some of the kids Christmas chocs yesterday with the logic that they would get more for easter....bad mother :)I also love the little crafting lady - what a great stamp! OMG!! I love your second card!! I love how you can use similar supplies and get completely different cards - I always love to see posts like this! Like others have said in comments above mine. "I so agree with you!" those two would be two of my happiest things too. Your cards are just so adorable and well done! Both cards are 'delicious'! Love chocolate....but OMG, that second card made me smile out loud, Darnell! Great job on both - thanks for the inspiration! Wonderful cards, Darnell and those same two things make me happy as well :) Great take on both the challenges. Clap Clap! One for each amazing and fun card!! Great colors on the first and a hilarious and fun image on the 2nd. Winner Winner - chicken dinner! Two cute, cute cards - and happy March 1st to you! Great cards Darnell, two of my faves too... what is it about chocolate?! HAha! These are too cute! And don't those chocolate kisses fit you, along with stamping?!!... ;) Totally fun cards, Darnell! Happy Sunday, enjoy! Nice to know, what makes you happy, dear Darnell. :-) Your cards are wonderful and positive, just like your post. I love the cute sentiment on the second one too and cute image hihi it makes me smile and nice add of that dots..if it is enamel dot you can join HOUSE OF CARDS for this month we have theme ENAME DOTS.. I believe yo've won both challenges although, personally, I would have chosen WODKA! I share your love of chocolate and card making (of course)! The first card is very sweet and I like the photo on the second card that Mister must have taken after you made the first card...! Thanks for putting a big grin on my face! Hahaha, Darnell,this lady on the second card is sooo fun, the card is great, it realy meakes me smile. Super cute and perfect composition. Ha! Clapping and typing do not work together. Love the lighthearted cards. Your stamping gal is a hoot! Thanks for putting that earworm in my head. . . . . .can't get rid of that pesky song now! Thank you for your kind comment on my last offering. Your cards are always a delight and these are no exception with an injection of your amazing sense of humour. I agree...can't get much better than chocolate and stamping...EXCEPT...doing both at the same time!!!!! Too cute for words, Darnell! Your posts always make me smile and I so love the cards you created too. Thanks for bringing me some laughs! Chocolate is my frienemy! I love seeing the excitement on that second card! Both, cute, funny and brilliant. Still chuckling. That crafty lady is a hoot, as are you dear Darnell. And I'll have some of that chocolate, please. Both of these make me happy! Where did February go? Life does indeed seem to be whooshing past at warp speed - I can barely keep up!! Lovely, fun, cool cards - the chocolate one has a lovely, cool blue background and the stamping lady is just so funny!!! But that is how I feel - every time I create a card I feel like Happy Dancing and sometimes I do if no on is looking!!! =] Have a wonderful day!! two beautifully CAS cards - love them both. I may not be commenting but I am watching!! Wonderful cards - I am actually clapping my hands. We are in the mist of packing for a move. It will be a while before I will post again but I will be watching! Fab cards Darnell. I personally love to combine the 2 things which make you happy - eating chocolate whilst card making :) I'd love to add a glass of red - but that doesn't make a good combo. Seriously love your cards! Chocolate definitely makes me happy, too. Darnell...you just crack me up! As always I love reading your blog, so funny. And your card is so sweet and the inside is just as fun as the outside. Loving this twofer format/kick that you have been on. Such a smart gal you are! I think I need to start on that too :). Did you know that when I lived in Canada, a 24, pronounce tofer, is a case of 24 beer. I am not a beer drinker, but I know that expression and thought you might like to learn of it too :). Two fantastic cards, Darnell. I'm with you on the chocolate love, for sure. Thanks so much for playing along at CASology this week. Fabulous cards Darnell - and I am still giggling at them both!! Vodka would have worked! Awesome cards pal! The ca-razy stampin' lady is so cool! Great cards, Darnell--especially love the first one! I'm supposed to be on restriction, too, but I put another bag of the dark chocolate snacking bark on the Costco list & hubby brought it home--off to get a piece! So glad you liked my new sediment - we felt it was maybe a bit much for some to go on the main blog lol! You have two awesome cards there, love the simplicity and style of your chocolate creation and the second one is just too funny! Oooooh Dippy - chocolate and crafting (with a dash of wodka on the side please.....!) - I started clapping my hands immediately (as in "if you're happy and you know it - clap your hands). Love the mad crafter image - fab! Oh Brilliant!!! I love chocolate and I love your cards and that image of the lady with the stamps is priceless! I can't stop laughing! I miss chocolate! Your cards cracked me up!!! Thanks for another super duper fun post Darnell ... oh and 2 wonderful cards. Great take on the challenge as always and thanks so much for sharing and taking part. These cards are so fun. I love the fun chocolate card with the blue that you used. Blue and brown are a great color combo. The second card is totally adorable. Such a fun image!! So funny! those are my two favorites that make me happy too! Love your perfect CAS cards! I wake up happy every day, then my feet hit the floor. No, seriously I am a happy person most of the time. Things are what they are and we need to roll with it. Your cards are great. Love the chocolate one and that second one is just how I feel and how I look when I make a card! Love love love your kiss card. It bring back memories of visiting the Hershey Plant and my son had a face full of chocolate and I will always love kisses!! Love both these super fun and cute cards, Darnell!!! What a great happy lady she is, hey!!! And I love the chocolate one, too!! The blue is lovely to go with the brown!!! Hi Darnell! I am loving both cards. I gave up chocolate for lent so your card reminded me of what I am missing! Look out on Easter! Love that second card - so cute. Have a great day. I won't tell you that I'm eating chocolate while catching up on my commenting.....I love your 'I made it'card, its hilarious and that image just makes me smile everytime I see it. The coolest card ever!!!! Two great cards Darnell! Love the pale blue with the chocolate colour combo. And your other image is such fun! Fabulous cards, love the chocolate one but the second one really made me laugh, just love it! I love the "I made this card." It made me laugh. From my friend's estate I got a stamp for the back of the card that says "I worked hard to make this card." That first card though I have to admit that I thought was poo, but poo with a heart... yeah, I've been cleaning up too much cat puke lately. Hahahahahaha...love these...hahahahaha Whoops, nearly fell on the floor, laughing so hard! The image of the woman...hahahahahaha!